Granger was selected to help the district successfully pass an $11.6 million bond in August 2016 to fund improvements to school buildings, with the primary focus on improving traffic flow, student learning, safety and security. Granger was selected to help the district successfully pass an $11.6 million bond in August 2016 to fund improvements to school buildings, with the primary focus on improving traffic flow, student learning, safety and security. 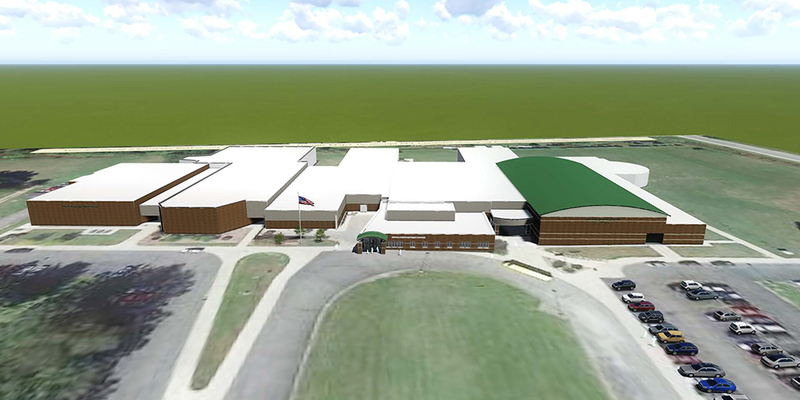 Granger is currently serving as Construction Manager for Phase 1 of the project, which includes a new design of school offices to create secure vestibules at all buildings, including a new entrance vestibule addition at the high school/middle school building to be complete by the end of 2017. Move parent drop-off to a parking area located east of the building and using the current parking west of the building for bus drop-off. Move playground north of its current site which will include a fenced-in area with a basketball court. Create a secure vestibule with a glass wall dividing the entrance/exit to ensure that all visitors pass through the main office. Construct a combined office space with meeting rooms and a new reception area. Redesign of the music rooms and storage space. Construct a new team room and a new storage building near the football stadium for track and football equipment storage. Create an additional drive off M-66 for a new entrance/exit north of campus. Upgrades to the bus garage building.